New Orleans commercial real estate depends on a thriving national economy. We just experienced, in 2008, the worst recession in history, and New Orleans managed to pull through due to reconstruction spending which kept the unemployment rate in the 4%-5% range compared to the national average at 7%-9%. As the FEMA funds dwindle down, the national economy will play a bigger role in the continued growth of the local economy, which is driven by the hospitality, medical, petrochemical industries. Personal income growth is one measure of how the economy is performing, since consumer spending drives about 2/3 of the economy. 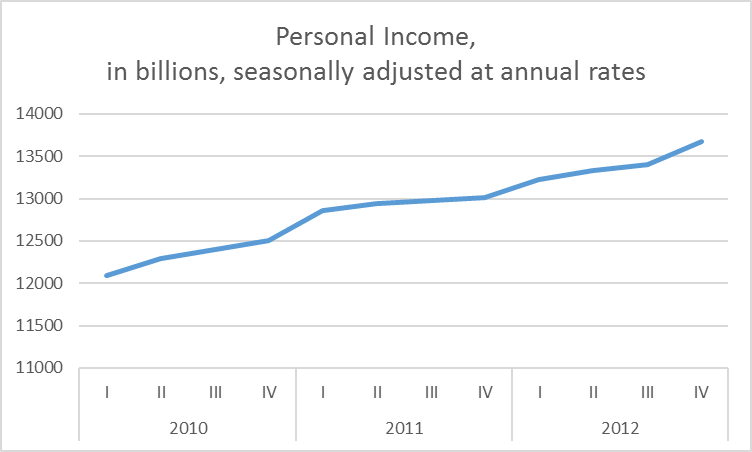 Today’s news from the Bureau of Economic Analysis is that personal income grew $127.8 billion, or 1.1 percent in February 2013 from the previous month. Personal consumption expenditures (PCE) increased $77.2 billion, or 0.7 percent. In January, personal income decreased $513.5 billion, or 3.7 percent, DPI decreased $498.3 billion, or 4.0 percent, and PCE increased $40.8 billion, or 0.4 percent, based on revised estimates. The January change in disposable personal income (DPI) mainly reflected the effect of special factors, such as the expiration of the “payroll tax holiday” and the acceleration of bonuses and personal dividends to December in anticipation of changes in individual tax rates. Excluding these special factors and others, which are discussed more fully below, DPI increased $46.8 billion in February, or 0.4 percent, after increasing $15.8 billion, or 0.1 percent, in January. 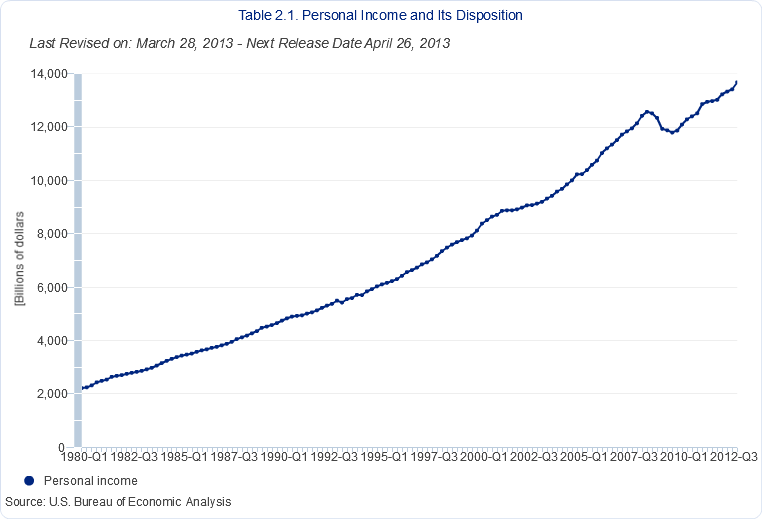 Personal income since 1980 shows steady growth and a nasty decline in 2009 due to the recession. Source: Bureau of Economic Analysis, Chamber of Commerce.